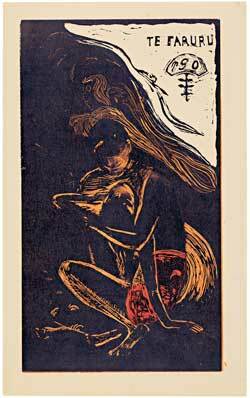 An extremely well curated and interesting treatment of relationships between Gauguin’s prints, woodcuts and oils. I was very glad to be able to catch the tail end of this very nicely put together exhibition which gives a good sense of the mixed media, besides the well-known oils, in which Gauguin worked. Most popular among Gauguin’s works are his vivid and colorful paintings, many of which are depictions from his time in Tahiti. 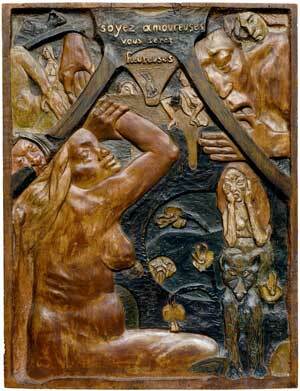 Stirring and beautiful, they represent much of Gauguin’s work, but not all of it. This exhibition is particularly adept at showing how varied, interesting and quite different in nature are Gauguin’s woodcuts and other prints and his sculptures and sculptural reliefs in wood. I was already familiar with the two wooden sculptural reliefs that are part of the collection at the Museum of Fine Arts in Boston, one of which was included in this show. Several more of those were on show here, darkly evocative and moving. 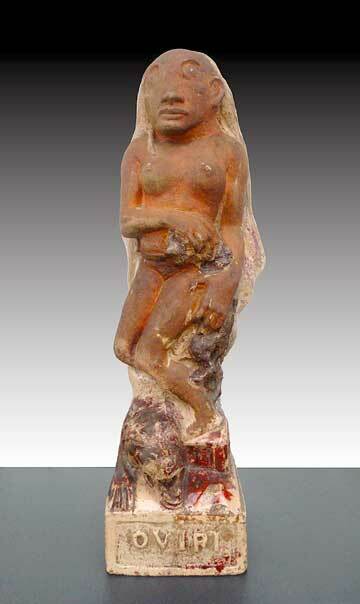 As well, there were numerous sculptures, many of them in wood, but a few of them in clay. Small, carefully carved, cylindrical icons showed remarkably vivid characters. The large Oviri (1894), in clay, has a kind of passionate drama to it. 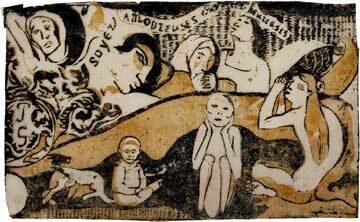 Gauguin’s history with printmaking is revealing, and also heartbreaking in a way. After his first trip to Tahiti, he returned with a bunch of oils he had done there and none of them seemed to gain him very much attention in the Parisian art market. On his next trip there he decided to produce a series of prints in a small book, Noa-Noa, that depicted and described something of the life in Tahiti. Far more subtly toned than the oils, the prints were charming and instructive but also not all that popular. As well, later on, Gauguin produced a series of prints – The Vollard Suite (1898-1899) – which he tried to interest a Parisian dealer in, but it turned out the dealer was far more interested in oils. Gauguin’s inclination in printmaking was generally quite different from that in his oil painting. 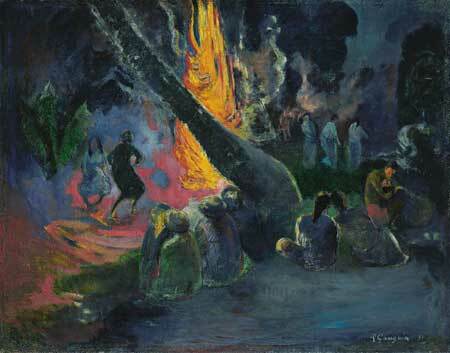 Though there is some coloration, the renditions are far darker, and sometimes considerably more muted than the oils. Apparently, Gauguin had some issues with his friend, the professional printer Louis Roy, whom he had enlisted to print some of the Noa-Noa (1893-1894) woodblocks. He appeared to want something more subtle, darker and moodier, feeling Roy’s results were too brashly vivid. Despite Gauguin’s reservations, I like Roy’s results quite a bit. This exhibit is comprehensive, bringing together many pieces of the same work from disparate locations, giving a unified sense of them. As well, it is very intelligently organized, showing similarities and contrasts between oils and prints at various relevant intervals. Commentary, both printed, and in the free audio tour, is cogent but informative. Seeing this coherent aggregation of works from a such an array of locations felt like a privilege and having it couched in such a well-coordinated and thought out way was a delight.